Hello dear English-speaking friends and readers! Your most beloved blogger and photographer is back! From the Sri Lanka airport where we left last time, I flew to the Maldives. Yes, maybe Maldives is not the place you would most expect from that proletarian fighter you are used to know me, but as I said in the first post about this last trip I have a bonus of 1250 euros to use in flights and due to the relative proximity to Sri Lanka it seemed logical to make a short trip. Moreover, since few years there is a new legislation that allows guesthouses and small hotels, so it is not necessary to go in luxury resorts. And anyway, don’t stress me, it is true that is a posh place but I wanted to visit it anyway. I’ve been there for a week. Since I organized well before going, it did not cost me an astronomical price, although obviously compared to Sri Lanka it is much more expensive. 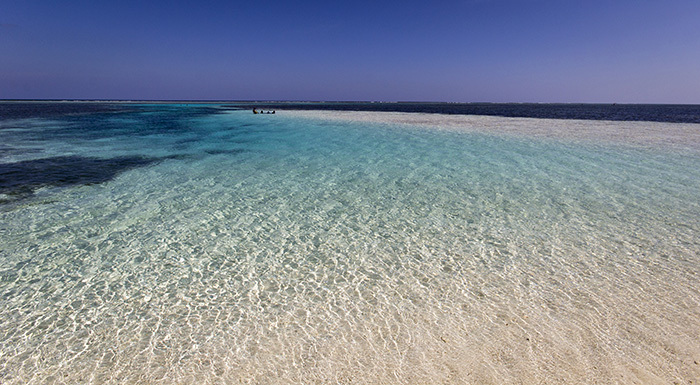 The Maldives is an archipelago of almost 1200 islands, mostly of them very small, of which about 200 are inhabited. 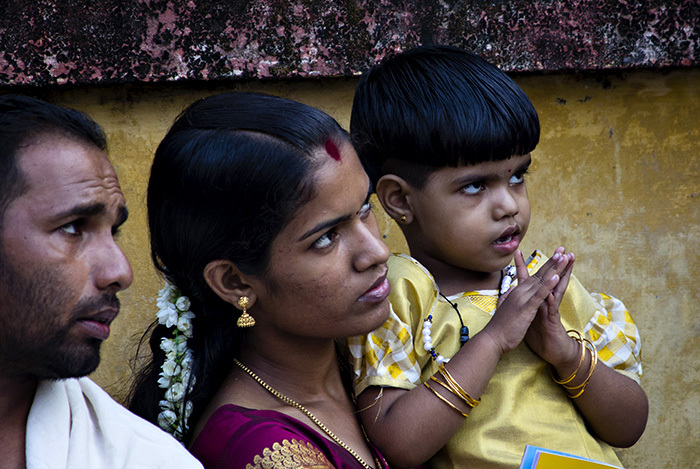 The inhabitants are about 400,000, coming mainly by migrations from Sri Lanka and South India around the fifth century. From the eleventh century, they converted to Islam, becoming a sultanate. In 1887 it became a protectorate of the Perfidious Albion (or UK), until independence in 1965. 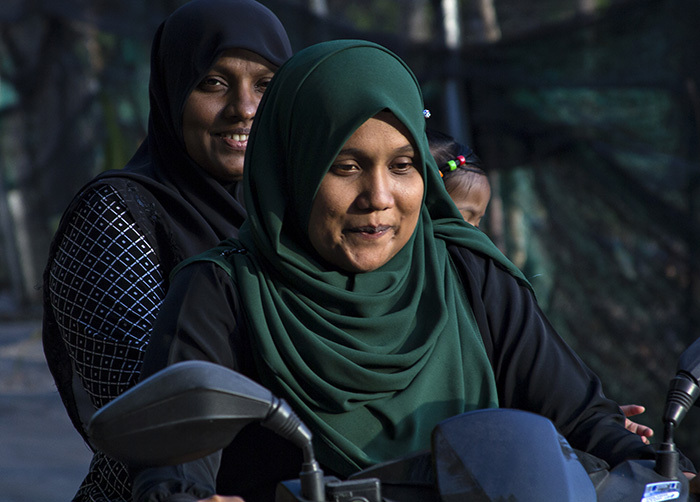 In the following decades the country was governed in a totalitarian manner by President Gayoom, who prevented any opposition until 2008, when, after continuous protests, he had to accept direct presidential elections that were won by opposition leader Nasheed. In 2012, Nasheed was overthrown by a coup, supported, as almost always by the coup d’etat, by the United States and in this moment there is a confused and precarious democracy. Since the two main parties are strongly Islamic, so is legislation. 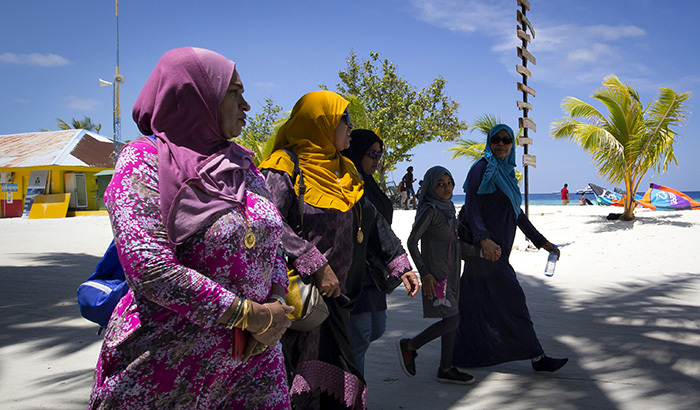 For example, no one can be given citizenship if it is not of Muslim faith, tourists can only go to some specific beaches (called “bikini beach”) if they do not want to swim fully dressed and alcohol is not for sale (apart from within some resorts). Apart from Malé, the capital, near to the airport, I visited two islands: Thoddoo, north-west of Malé, and Maafushi, a little south of Malé. In Thoddoo. And how could I not love it? 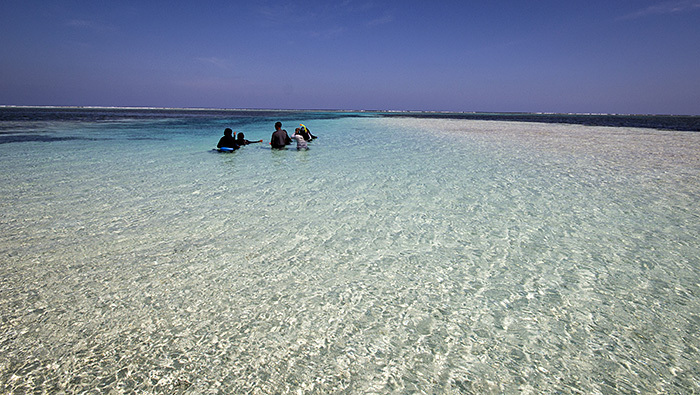 This spectacular sea, from emerald green to light blue is due to the coral reef that creates a sort of natural pool. Orsi, an Hungarian girl, reading a book that at least from the title seems interesting. She took a photo of me on the swing in the sea that was a success on Facebook. 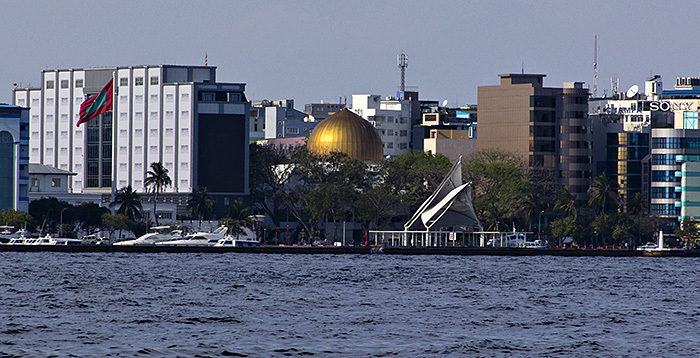 The capital of Maldive, Malé. 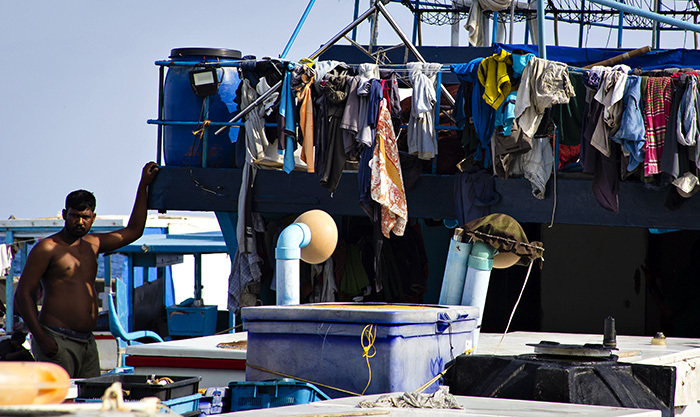 A fishermen boat in Malé port. 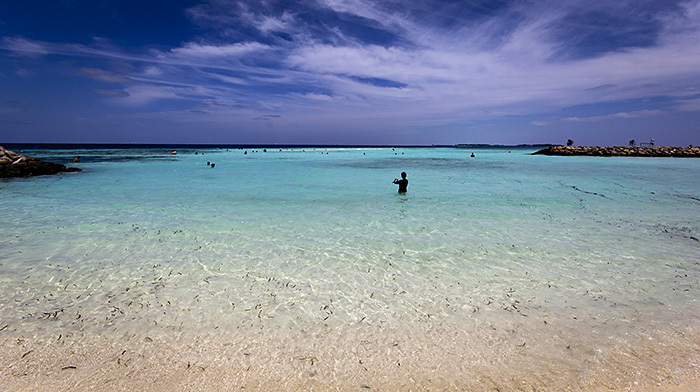 A beach in Maafushi, the other island I visited. In general, I liked it less than Thoddoo because it is less green and they are building monstrous concrete structures. However, it offers more activities and has many bars and restaurants. 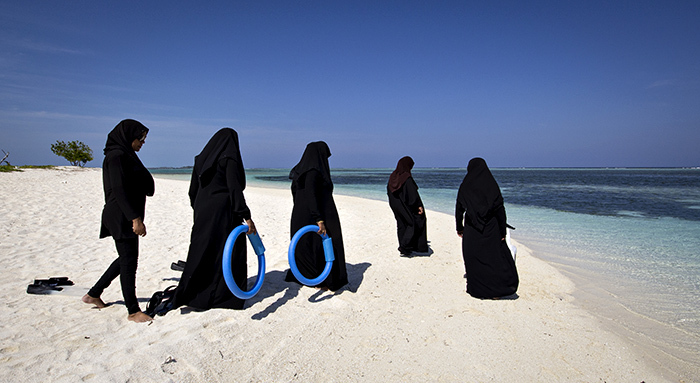 Maldivian women go for a swim in a non-bikini beach. As I said, they swim fully dressed. After being soaked in turquoise water for a week, I left Maldives and I flew to: Kerala in India. It is the third time I come in India. The first time, in 1996, for a short trip to the north and the second time, between 2013 and 2014, for a journey of almost 6 months to the south, most of the time lazing in Goa. This time, as I said, I came to Kerala, a state in south-west. Nicknamed “the God’s Own Country” has a very ancient history and it is mentioned already in 3000 BCE in Sumerian registers as the “Garden of Spices”. The Kerala spice trade attracted all the great powers: Babylonians, Assyrians, Arabs, Egyptians, Phoenicians, Greeks, Chinese, Romans, etc … and local literature of the time tells of the Roman ships arriving in the port of Muziris (of which it is unknown the precise location, probably it was near Kochi) full of gold and leaving full of pepper. It is also called the “Red stronghold” because is often governed by the Communist party that here has the majority since several decades. And the results are evident: higher literacy rates in India (over 90%), lower corruption, lower poverty, lower economic disparities, and in general a lower social hierarchy that in India is generally still very strong due to the caste heritage. 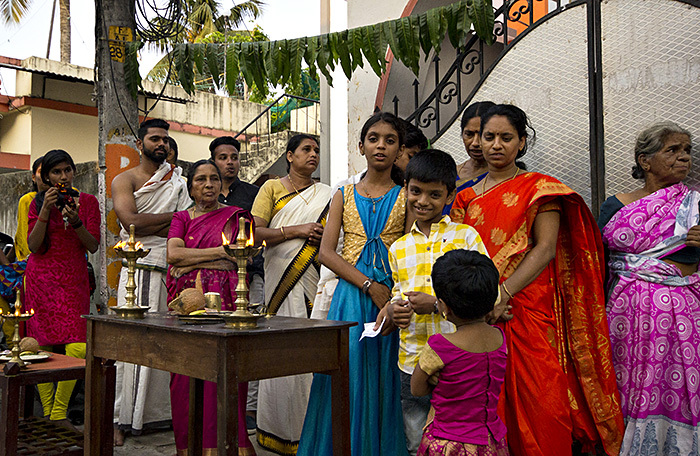 There is also a great religious tolerance, in fact with the Hindu majority peacefully cohabit Muslims and Christians. Chinese fishing nets in Fort Kochi.These nets are stationary and are lowered and raised using a weight system. 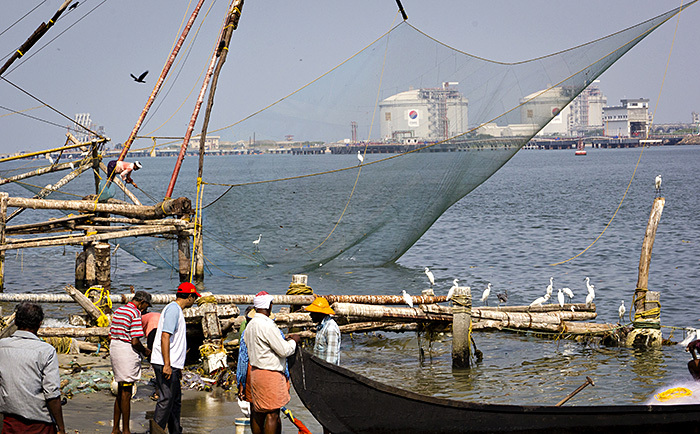 It is very likely that the name Kochi (also known as Cochin) is due to these nets, “Co-chin” (“like in China”). Other Chinese fishing nets. 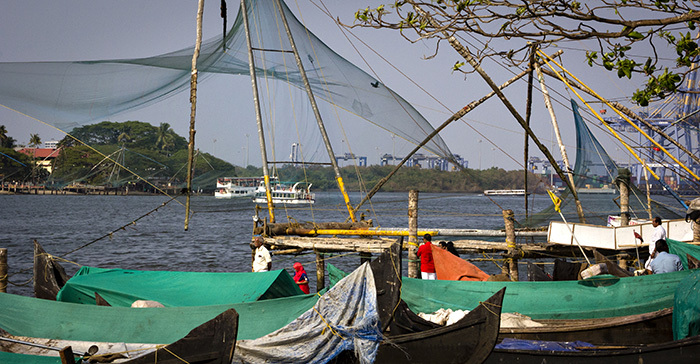 Fort Kochi has always been a very important port, point of passage of sailors from all over the world. 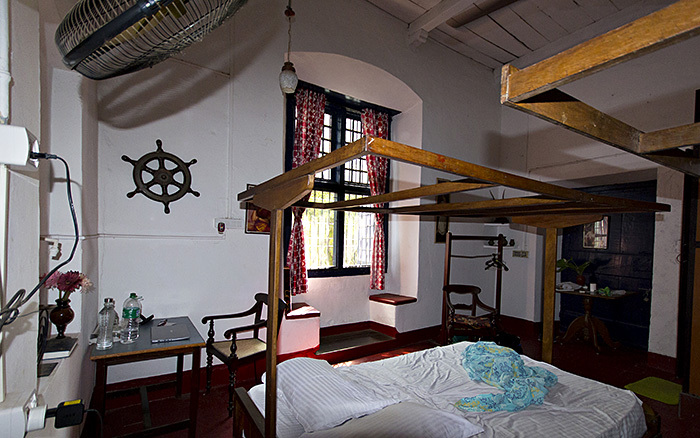 Inside Fort Kochi many old houses have been converted into guesthouses, restaurants, shops etc… This was my room and I didn’t understand the reason many tourists came to take pictures of the house from the street. I asked the owner and he replied “Don’t you know?! This is the house where Vasco de Gama died 500 years ago!” (Vasco da Gama, Portuguese explorer, was the first European to reach India by sea, in 1498, circumnavigating Africa and making the crossing from Malindi. He died of malaria on December 24, 1524 during his third trip to India). The owner didn’t know in which room he died (actually I checked after and it is not totally sure he died in this house), but it may have been this room. So, an historic room: not only probably Vasco de Gama died there, but also slept (thankfully awakening) Dekaro! And now I give you a prophecy: in 500 years the reason the tourists will take pictures will be because the good Dekaro once slept there. Eeeeeeehhhh… Ok, ok, I admit that I was a little carried away by enthusiasm. You, however, always merciless, never that give me a joy. 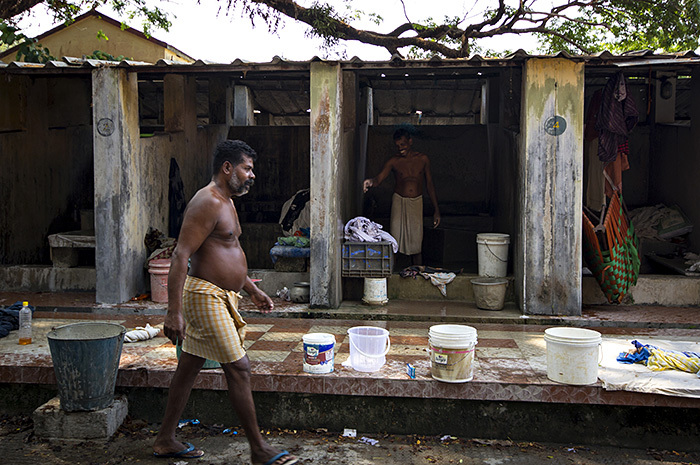 A factory where clothes, mostly coming from hotels, are washed by hand. 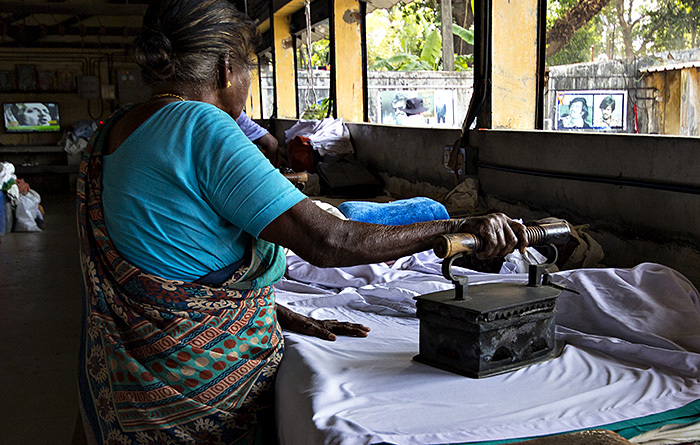 A lady is ironing with a heavy old iron powered by coal. 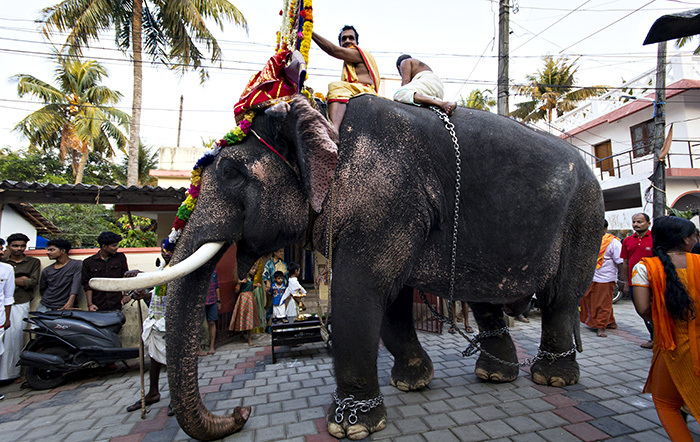 Believers wait for the passage of the elephant, to which they will offer coconuts, bananas and other fruit. 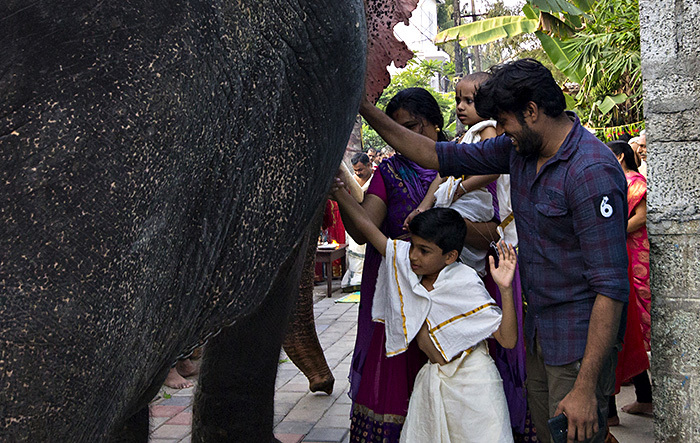 Family looks at the passing elephant. 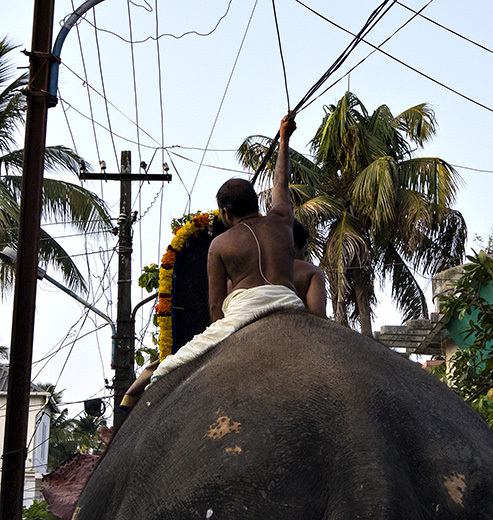 Since the two men on the back of the pachyderm were dangerously poised, they often grasped to the electricity wires. No much desire to live that day. 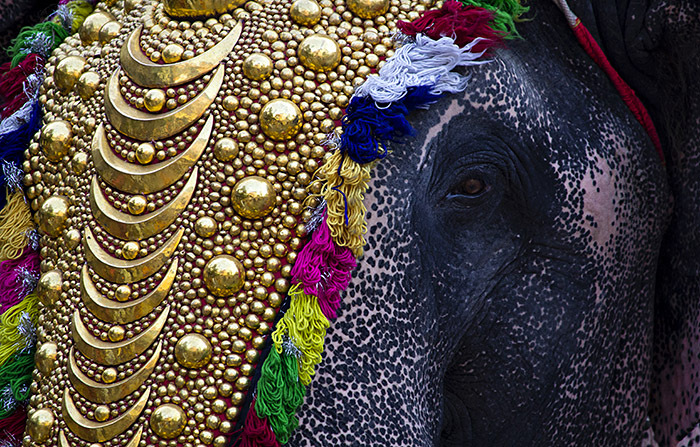 It seems that touching the elephant’s belly brings good luck. A belly-hit against the wall a little less. 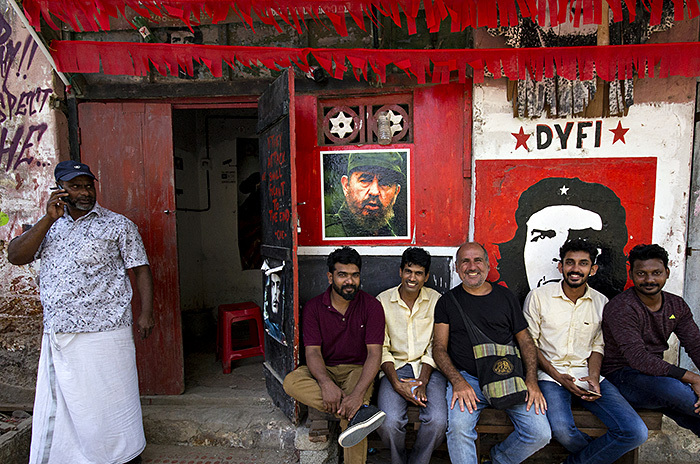 A short visit to Kerala’s comrades. 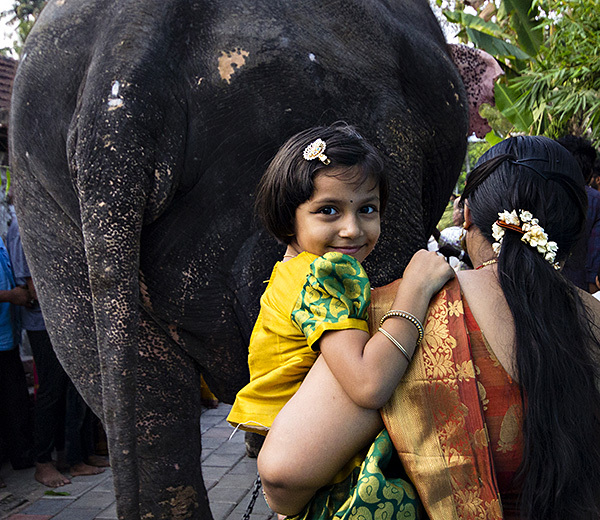 Ok, see you in two or three weeks for new stories and photos of Kerala and next place, still in India. This entry was posted in india, maldive and tagged india, maldive by Dekaro. Bookmark the permalink.